The Tyrant's Grasp Adventure Path reaches its world-shaping conclusion! The heroes learn that the keys to stopping Tar-Baphon's deadly Radiant Fire are the shards of the Shattered Shield still lodged in their souls—the only things dangling their lives above the grasp of the Boneyard. The heroes return to Lastwall to confront the Whispering Tyrant, but discover that he has led his army to the fields outside the city of Absalom. There, the Whispering Tyrant plans to blast his way through the city and crack the Starstone Cathedral open, transforming himself into a true god! The PCs must battle the lich's most powerful allies, turn the power of the Radiant Fire back on the Whispering Tyrant, and end the threat he now poses to the world. 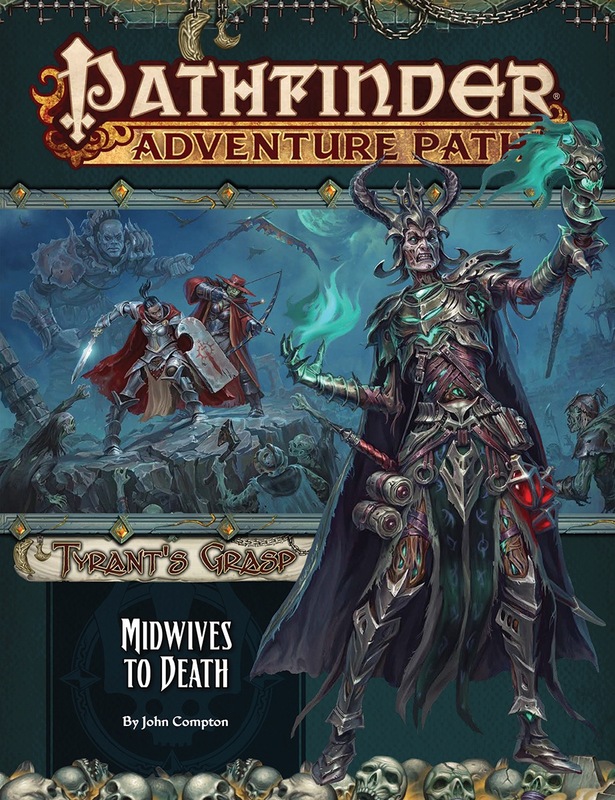 Midwives to Death is a Pathfinder Roleplaying Game adventure for 16th-level characters. The adventure concludes the Tyrant's Grasp Adventure Path and brings dramatic changes to Golarion. This volume also includes an extensive article showcasing the final material written by Paizo's developers for the first edition of the Pathfinder RPG. Hmmm. Wonder how much damage/alteration is going to be made to Absalom and/or the Starstone Cathedral. This is it - the final Pathfinder 1.0 product! I still love this Game! Might have the effect of what happened when Forgotten realms flipped over to 4th edition or so, The Spellplague, and other world shaking stuff changed things so much with how things worked that a new edition was needed to handle it. Wow. Well at least even if they kill Tar-Barphon they won't actually win since his phylactry is kind of stuck deep in Gallowspire. But this...seems even more epic than Return of the Runelords. So... "dramatic changes for Golarion"
Dramatic changes = 2nd edition. Woah, bit of action on Absolom! Ah, it's the book where people's dreams and hopes die, everything that's beautiful vanishes, and I get to feast upon all the anguish and sorrow. Well call me surprised, Absalom actually gets featured in AP ._. While I'm sure that dramatic changes are going to be handled as power shifts and new regions, or maybe a new deity or even the vanishing of the starstone itself... Aroden could be revived or something around this. I don't think it will change the entire landscape or how magic works or the core nations, and perhaps not major concepts as well. Squealy Nord, God of Pigs. For being "the city at the centre of the word" their big products don't do a lot there. I'm pretty sure there will not be any more gods. But I've been known to be wrong before. I Triple Dog Dare someone to do Mythic Nord. The finale of PF1 reads like it is literally setting about to shoot a GIANT DEATH RAY at the settings BBEG. I love it! Use the Starstone to power a Wave Motion Gun? My guess is the "cracking open of the starstone cathedral" will change how magic works. More seriously, this looks like an intriguing continuation of the setting changes put in motion by Return of the Runelords. I'm also wondering if the AP could end with Aroden's return, but this time as a deity of death (not necessarily an evil one). Maybe Pharasma's has been hiding him all along, teaching Aroden part of her portfolio. Well if Bane from FR could hide in a 'sentient shell' *cough cough* Then why not? Just to manage expectations here... this Adventure Path comes CLOSE to Absalom, but doesn't go into the city itself. If the PCs do their job, they stop the Tyrant before he gets that far. Absalom is a huge city with LOTS of potential, and it's not something we're going to avoid doing adventure path content with and in forever. But it's not going to be fully explored and you won't get a lot of new info on the Starstone in this adventure. The climax has other things to focus on that'll be more clear once the adventure path is out. It's not the first time "Dramatic Changes" in a story line or setting happen to foreshadow a new edition. Monte Cook states how in "Ptolus" he foreshadowed the move to a new edition by having another moon in the sky. When the moon finally revealed itself, the PCs were reborn in the new edition. I thought that was darn clever. Considering that the entire Pathfinder campaign setting is predicated on Aroden's death, and it's been stated by developers numerous times that they'll probably never reveal how he died - no, Aroden isn't coming back. It would be also be a deus ex machina-sized cop out. I'm just bummed that some of Golarion's biggest baddies have been killed off lately. Hopefully we get some new ones in 2nd edition. Eh. I remain unconvinced they're going to actually KILL off Tar Barphon. They might blow him up but until someone gets a hold of phylactery, I think he could still be there. Well this can be a new golden era where bands of vaguely psychopathic kleptomaniacs will no longer roam the land hunting down eldritch evils. 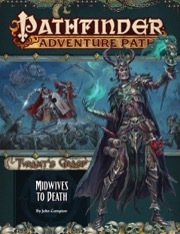 This volume also includes an extensive article showcasing the final material written by Paizo's developers for the first edition of the Pathfinder RPG. I imagine it will be a retrospective. The description says this AP will be for level 16 pc's. What will the final level be (i guess 18)? Will the characters be able to level up to 17 or 18 before the boss fight? Most of the newer AP's give the players some fights at their final level, so I'd postulate that this one will, too. it’s word-for-word from the “Adventure Path spoilers” section of book 1 and casually drops information in a manner such that the person reading it is supposed to know the stuff, and it casually drops names (e.g. Radiant Fire) that isn’t necessarily supposed to be known to prospective players of the AP. I wish they’d change the product description for those reasons. It's the final of the AP, of course it's gonna mention previous important things in the AP that led to this. PSSST! Boss! I think you meant finale not final! Your postulation is more or less correct! It means we've got several pages dedicated to providing our developers (and a few other internal folks) their last opportunity to provide you with content designed for the first edition. This volume has no separate bestiary (although there are new monsters) and no Continuing the Campaign article (although there's plenty of great GM advice). I won't go into who picked what to write about just yet, although you'll see what each of us created when this volume comes out. There's a truly staggering variety: new archetypes, a prestige class, NPCs, monsters, and more. I think a few people will think "Wow, I never expected to get that slipped into first edition, but here it is!" and others will think, "Hey, that's something I never thought of before now, what a great last-minute addition!" I think it's been delayed until the next month. I'd wondered about that when I saw that July was being skipped altogether for the release schedules of products. I can be patient. I just hope they provide a way to start a subscription in between what are now the two August products in this line. This & Starfinder AP#18 would have been the only july products, which would make no sense financially. I am sure the Paizo website will be very busy in July -- there just won't be a lot of cash registers ringing unless they have a pre-2nd edition sale. No "Continuing the Campaign" article? This worries me a bit. And there could be enough world-changing stuff going on by the end of Book 6 that it doesn't make sense to continue the campaign (unless one does that with new/different characters). Does this adventure path go all the way to 20th level? If so, there would be no reason for a "Continuing the Campaign" article. There's rules in the Core book to continue beyond 20th level, and there's also always mythic levels that can be taken. Campaigns can indeed go past character level 20. There's both the Mythic rules and the brief one-page mention of epic rules at the end of the CRB's chapter 12. Veterans of Paizo's three Dungeon APs (SCap, AoW, and STap) can easily have gone past character level 20, using the ELH. Obviously Mythic and Epic are two different things, but they each serve to "power up" the characters. Some argue that the math starts to break down past character level 20, just as some might argue that the high 'teen levels are not that good either. But that doesn't make the game completely unplayable. So no, I don't see character level 20 as an immovable campaign ender.